Environments; the School of Desig and the School of Fashion. NOW MORE THAN EVER, DESIGN is DRIVing CHANGE. JOIN US in REIMAGINING the ROLE of design IN THE WORLD. performing arts school, a legendary graduate school, and other renowned programs. Here you can master established creative practices or advance emerging ones and study across all university disciplines. Surrounded by fresh perspectives and the university’s extensive resources, you research and create in broader, deeper, and more forward-looking ways. And guided by Parsons faculty, you produce work that reflects human experience while responding to the call for innovation and change. Expanding the Boundaries of Design At Parsons, you discover that art and design have the capacity to disrupt the status quo and spark the change needed in the world today. They can be employed to confront climate change, address race relations, and transform management through thoughtfully conceived objects and ideas. Here becoming an artist, designer, or business strategist means working across disciplines, learning to collaborate, and questioning every assumption in order to create more reflectively and responsibly. We give you the freedom to do so by integrating disciplines, inspiring personal change, and offering support for forging new paths through art, design, and industry. and networks that support you during your time on campus and beyond. TOP: For the Empowerhouse project, students partnered with local agencies to develop ways in which design and policy could improve socioenvironmental conditions on varying scales. The project resulted in a two-family house built with Habitat for Humanity, which led Habitat to adopt new energy-efficient building methods. BOTTOM: Parsons students used weather balloons outfitted with digital cameras to map Union Square and other Manhattan green spaces to study change in urban ecosystems over time. FACING PAGE: An NYC government partnership enabled students to transform a campus parking spot into a public space with seating and tables, built from sustainable materials with Parsonsâ&#x20AC;&#x2122; Making Center facilities. TOP AND BOTTOM: Experienced in a range of media and teaching methods, Parsons instructors help you express your ideas, explore techniques, and develop solutions to problems framed by design. FACING PAGE: Your community lasts long after you graduate. Faculty remain mentors, alumni connect professionally, and peers form organizations and businesses together after graduating. experience and connections. Based in a global center of culture, commerce, and innovation, faculty put you in contact with the city’s game changers— the United Nations, Planned Parenthood, Google, and Teen Vogue, to name a few—on partnered projects. Peers test your ideas and inspire new directions—and often go on to become your professional colleagues. Open minded, independent, diverse, and aware, they come from every state in the United States and more than 100 countries worldwide, making our university’s student body one of the most international in the country. with the tools and a creative community to last a lifetime. Art and Design in Global Contexts Art and design speak clearly in the global conversation. Learn the language through workshops and courses in which you work directly with creative communities around the world, bringing together knowledge, perspectives, and resources to address critical conditions facing the world today. International educational partners—and Parsons Paris, our European hub— offer sustained cultural and academic immersions. Parsons orients you in global contexts, where creativity catalyzes innovation and change. a climate disaster– preparedness game for the Red Cross/Red Crescent, which was presented at the UN Climate Change Conference. FACING PAGE: Students and faculty of Parsons’ DESIS Lab, the U.S. branch of an international social innovation incubator, interviewed Brooklyn residents with the aim of developing environmentally sustainable alternatives to cars. over time, in various settings, and as a means of fostering change. Your First Year Your first year is one of discovery and exploration. Studio courses build a variety of making skills, while seminars expand your ability to reflect critically on art and design and their connections to the wider world. Together they provide a base for your creative practice and intellectual development over the next three years. They also introduce you to systems-based approaches to design, in which you consider a range of factorsâ&#x20AC;&#x201D;sustainability, technological change, user experience, globalizationâ&#x20AC;&#x201D;to create work suited to an evolving world. The forces of change in society today arenâ&#x20AC;&#x2122;t one-dimensional, and neither are your interests. Our approach to education gives you the tools you need to explore complex issues and bring together a range of talents and passions in studies that are wholly your own. The process takes you throughout New York City, where you encounter firsthand the ways creativity fuels urban life. You apply your new perspectives and critical-thinking and communication skills to share your insights. The first year also allows those entering as undeclared students the opportunity to explore a range of art and design disciplines, which helps them decide on a major. TOP: A course project had students place 3D letterforms throughout the city, engaging subway riders with public art and helping students understand the effects of changing scale and setting. BOTTOM: Policymaking at The United Nations directly affects global climate change. In the first-year Sustainable Systems class, you learn how. FACING PAGE: First-year students develop their color theory abilities on-site at a Brooklyn handcrafted wallpaper firm. provide further insight into the world of professional practice. and housing studios with community partners. TOP: Alexander Floyd, rendering, Aquatic Axis. Aquatic Axis, created in Design Studio 5, proposes a mass transport connection between northern Manhattan and the South Bronx. The project is designed to facilitate commuting and provides opportunities to connect with the natural environment. BOTTOM: Jialei Tang, rendering, Play-nature. Designed in a studio course, Play-nature is a care center for four-year-olds in the Bronx. Design features including acoustic ceilings and recessed classrooms are intended to accommodate the schoolâ&#x20AC;&#x2122;s teaching methods and address childrenâ&#x20AC;&#x2122;s needs. FACING PAGE: Naiky Paradis, model created for the BFA Architectural Design course Design Studio 5, Transit Hub. you in the world of indie game design and development. It gives you tools and pipelines that grow and expand with your skill set and provides you with an understanding of the process from brainstorming to game publication. Creative Technology focuses on bringing art- and human-centric design into programming and engineering, providing a set of tools drawing on physical computing, creative coding, user experience design, and fabrication. The background is a rendering of a café Finn designed for a hydroponic facility in Gowanus, Brooklyn. scientist or environmentalist might use. Shown behind Kendall is a garment she created for Kellektiv, her thesis, which was aimed at empowering women recovering from sexual assault. thinker, and maker—means in the world. of climate change and species extinction while also examining the practice of guerrilla gardening as a means of connecting humans and the natural world. Shown is a runway look by Olmedo and his research project. critical thinking and practice through your work. fashion design that resonates with your personal interests. This innovative program has trained generations of designers who continue to redefine the global fashion landscape. lecturers, and external critics engage with you on creative, intellectual, and practical levels throughout the process. External partners offer you opportunities to develop a professional practice through collaborative projects and competitions that augment your academic experience. Offered both in New York City and at Parsons Paris. drawing, and sculpture as well as more innovative interdisciplinary methods that can include public engagement, video, animation, photography, and digital imaging. Internships and electives in topics such as art history, theory, and professional practices broaden your perspective. Illustration BFA Cultivate your vision, authorial voice, creative problem-solving abilities, and curiosity while translating ideas into forms including picture books, comics and graphic novels, animation, hand lettering, editorial and advertising illustrations, toy and puppet designs, and surface and display design. internships with partners including Nickelodeon, 350. Brooklyn and MoCCA Fest and gatherings of professional organizations build your network. Today, as technology and global networks transform the world, designers must be versatile, knowledgeable problem solvers. This program develops these qualities, preparing you to work in social, cultural, and ecological fields. Many graduates combine design and entrepreneurship in innovation-focused businesses. projects with partners including the Urban Homesteading Assistance Board, SWALE, the Center for Urban Pedagogy, and the Baltimore Symphony Orchestra. 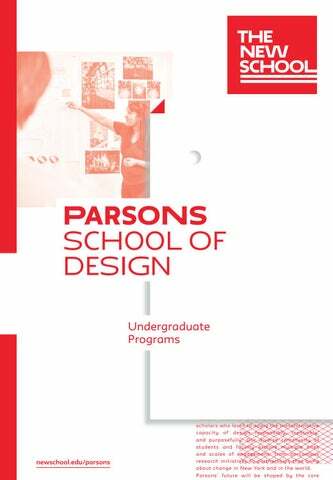 Electives offered at Parsons and throughout The New School broaden your knowledge and interdisciplinary skills. TOP: Alexis Walsh. LYSIS. For her fashion collection, Walsh fashioned couture garments featuring 3D sculptural elements created with Shapeways software. BOTTOM: Yu Ling Wu, Know Your Rights. Wuâ&#x20AC;&#x2122;s round accordion booklet contains legal rights information for immigrants facing deportation or ICE raids; the book can be disguised as a wearable, coaster, or magnet. FACING PAGE: Amplify: Creative and Sustainable Lifestyles in the Lower East Side. Amplify addressed sustainability and the everyday needs of older adults in New York City through collaborative support services. The background is the interface from Rohil’s game Here Comes the Neighborhood, in which players explore individual identity in urban settings. possible by the university’s BA/BFA program. she learned much more than bookbinding. Shown behind Yu Ling is an artist’s book she made with an unusual folding scheme meant to evoke the stimulating environment of New York City. projects that I’m most proud of,” she says. ask herself why she was creating something. Interior design BFA In 1906, Frank Alvah Parsons established the countryâ&#x20AC;&#x2122;s first interior design curriculum, framing the discipline as an intellectually rigorous practice and a creative force in everyday life. Today this research-based, design-intensive major prepares you for careers in which you create comfortable, imaginative, and intelligently designed interiors. In this major, you develop the technical, conceptual, aesthetic, and professional skills needed to establish a successful creative practice. You explore analog and digital processes that extend to video/motion production, photobooks, and installation art. internships at galleries, publishing houses, and cultural and commercial organizations. Access to state-of-the-art labs, shooting studios, and equipment supports your creativity; student exhibitions and critiques build your network. Prism Magnifier is a desk magnifier ma glass crystal that renders image and tex the actual size. The magnifier was desig by Daniel Martinez for the class Small Matter, a collaboration between Areaw Parsons The New School for Design. Daniel Martinez is a Product / Industri Designer based in NYC. His designs ex simple beauty, form and function, crea construction. Making Center and Healthy Materials Lab. and integrated range of skills that can be applied across the design strategy spectrum. Courses and projects led by practicing professionals enable you to work with entrepreneurs, designers, activists, and academics at organizations ranging from HUGO BOSS, Panasonic, and Design Within Reach to the United Nations Development Fund and the City of New York. You explore interests and career paths in electives offered throughout The New School. Internships give you real-world experience. You graduate prepared to develop design-driven strategies, manage projects, and assume entrepreneurial and leadership positions. Offered both in New York City and at Parsons Paris. a student in the BBA Strategic Design and Management program, Alex delved into the human factors that effective design takes into consideration to make products and services successful. His aptitude for listening, reflecting, and finding creative solutions to problems big and small brought him success in internships at Michael Kors, Stella McCartney, Barneys New York, and a Broadway PR company. He ended up in one of his field’s most coveted positions: design researcher at IDEO, the legendary design and innovation consultancy. producer for NBC television’s TODAY Show. Shown in the background are William Near and his son Keeler. Keeler is wearing a shirt he made for his thesis fashion collection. “The energy of Parsons was wild; it was cool. was a really fun, upbeat situation,” he recalls. Parsons Paris, located in the heart of the city, offers you an intimate, atelier-like environment in which to create, guided by Parsons’ signature curriculum. institutions including MAD (Musée des Arts Décoratifs) provide unparalleled research opportunities. All of these resources are offered as part of the university’s commitment to preparing you for global creative industries. Quacquarelli Symonds World University Rankings (2017), a London-based global provider of specialist higher education and career information. Minors A growing array of minors offered at Parsons and throughout The New School advance your study of art and design, broaden your professional skills and perspectives, and give you a competitive edge on job and graduate school applications. limitations in some programs make applications necessary for selected minors. 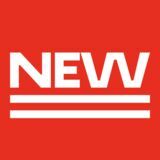 For updated information, visit newschool.edu/academics/minors. Youth and Teen Programs Want to build a portfolio or take art and design courses before beginning undergraduate studies? Start your Parsons experience now in a pre-college program on Saturdays throughout the year in New York or develop a portfolio online. Summer Intensive Studies are offered at our New York and and design strategy. Offered through Open Campus, The New Schoolâ&#x20AC;&#x2122;s continuing, professional, and pre-college education program, Parsons youth and teen programs enable you to explore creativity, build skills, network with peers, and, in some cases, earn college credit. in BBA Strategic Design and Management cannot participate in the BA/BFA pathway. Interior Design and Cardozo libraries. TOP, FACING PAGE: The Making Center—the university’s network of cuttingedge creative tools—is located primarily in the Parsons building at Fifth Avenue and 13th Street. MIDDLE: The Kellen Archives, part of the university’s extensive archival holdings, contains materials documenting Parsons’ history and creative output, including project work by our celebrated alumni. BOTTOM: Exhibitions at the Sheila C. Johnson Design Center invite the public to participate in discussion of design’s role in fostering social good. MIDDLE: The Sheila C. Johnson Design Center presents exhibitions on timely topics such as the intersection of technology and craft. Shown here is an exhibition developed with the Royal College of Art (RCA), London. BOTTOM LEFT: Partnered projects with fashion retailers like H&M challenge students to design within real-world industry constraints. BOTTOM RIGHT: Sol LeWittâ&#x20AC;&#x2122;s Wall Drawing #1073 A and B, Bars of Color (New School), 2003/2015, shown here, enlivens the first and second floors of the universityâ&#x20AC;&#x2122;s 55 West 13th Street building. with themes and spaces of The New School. moments of inspiration and discovery. environment; and technology in society. equipped to address pressing social issues. leadership, and creativity align with yours. perspectives and expanding your network. TOP: Parsons—the U.S. home of DESIS, a global service design organization—recently hosted “Resilient Cities, Livable Futures,” a conference on strategies for making urban centers resilient to weather-related disasters. MIDDLE: A student creates a composition using samples from the Healthy Materials Lab’s library of nontoxic products such as rubber flooring, tile backing made from reused juice boxes, and flooring made from linseed oil, wood flour, and jute. Also shown are eco-fabrics created in a collaboration with Tide detergent. BOTTOM: At far left is Elaine Welteroth, editor in chief of Teen Vogue, in conversation with Amy Farid and Anastasia Garcia at Fashion Culture and Justice, a campus event. FACING PAGE: A DESIS Lab research exhibition. the university–New York City experience. relationships with university partners, faculty, and fellow students. well as programs for veterans of the U.S.
Housing isn’t just four walls and a roof. The New School’s code, 002780. Two Design and Technology graduates explore the con tentious relationship between huma... Don’t Tell a Story — Illuminate a Manuscript We embrace new media, design, and technology to reimagine the power of storytelling. Close Silicon Valley’s Gender Gap Two MFA Design and Technology graduates spark a love of technology in girls. This brochure is printed on 100 percent post-consumer recycled paper with UV inks that conserve energy and material and do not release VOCs into the atmosphereâ&#x20AC;&#x201D; reflecting the universityâ&#x20AC;&#x2122;s embrace of environmental responsibility. s e q u e n ce , o n e i n t h e f a l l s e m e s t e r a n d o n e i n t h e s p r i n g .